This listing is for ONE personalized ring. If you'd like more than one, you will need to choose the number of rings you'd like from the dropdown menu provided. A 3mm wide stainless steel comfort fit band ring is hand stamped by me in my petite script font (lowercase only!) with your choice of text (up to 15 characters or numbers, including spaces, small heart available). Available in whole sizes only 4-10. Stainless steel is a fantastic sterling silver alternative. It is more hypoallergenic than even sterling silver and will never rust or tarnish. It is recommended rings not be worn in water, however, as the darkening in the letters will wear quicker. To order, choose the number of rings you'd like and your size from the dropdown menu and add to your cart. Rings are available in whole sizes ONLY. 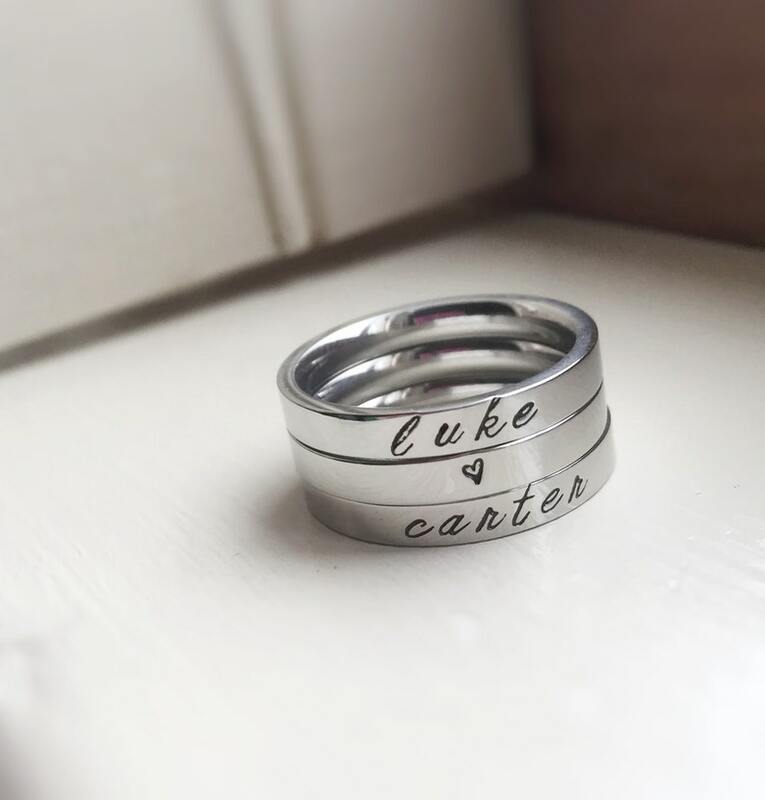 Since these are custom made-to-order, there will be NO refunds on rings if you order the wrong size, so please be sure you are ordering the correct size. I can only stamp the outside of this piece. The item came exactly when she said. And it absolutely perfect and looks just like the picture! Great work ! Came out perfect, wife loves it!